We were happy to partner with Pamela Salzman for this delicious and easy Sumac-Spiced Chicken with Pomegranate Glaze recipe! ‘Tis the season for entertaining! I know many people toss aside the clean eating when they invite friends over for a dinner party, but I am not that way. I love the opportunity to share healthy food with those I care about. And I also notice that more and more people are trying to eat “better” and are relieved when they don’t have to eat outside whatever plan they have committed to. I recently had a dinner party and everything I made was fresh and whole foods-based, nothing heavy or over-the-top. My friends were delighted to leave feeling satisfied, but not regretful! This pomegranate-glazed chicken dish is a new favorite for weeknight dinners and company alike. And it passed the Mr. Picky test, so I know I could serve this to kids as well. As you know, I am a big fan of Moink Box, which I have been subscribing to for over a year. You can read up about the inspiring story behind Moink here. The company is both a source for humanely-raised and ethically-sourced meats and fish for the consumer, as well as an outlet for grass-based farmers to sell their proteins. I really struggle with the idea of buying organic meat and poultry from the supermarket when I know it’s from a mega farm. But I also don’t have time to run around visiting local farms as much as I love the idea of that. 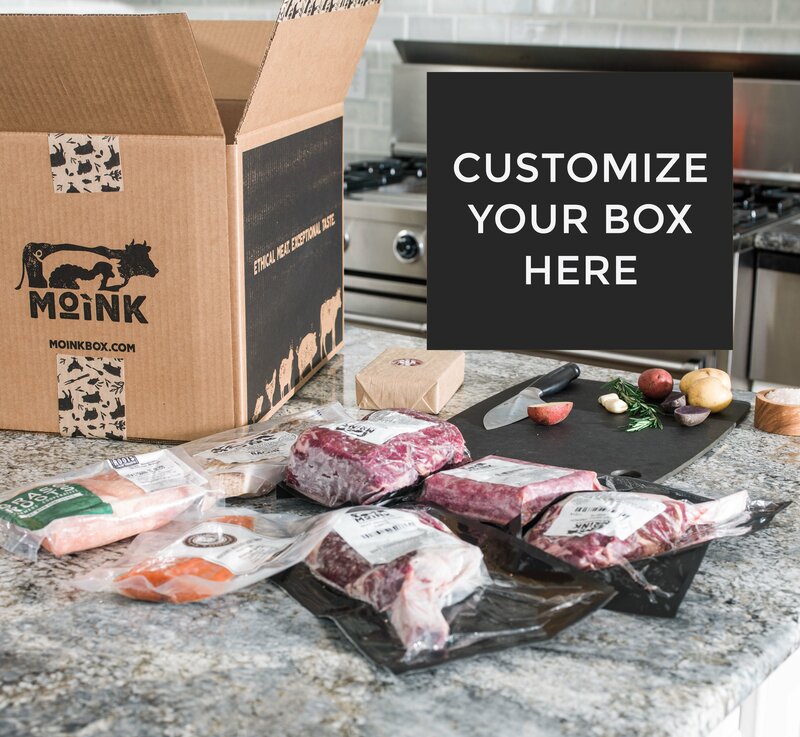 Moink boxes are customizable which is key for me since we don’t eat pork or lamb. So I was easily able to swap those out for wild salmon and chicken, which are my favorite animal proteins. Everything comes frozen, which is awesome for working mamas, like me. No time to run to the grocery store? Pull it out of the freezer. But the most important thing is that all the proteins are grass-fed/pastured/wild, humanely-raised without antibiotics on small farms. You can see the contents of my Moink Box above. My other recipes using Moink proteins include Greek-style Chicken Paillard, Persian Fesenjan, and Brown Butter Miso Salmon. This recipe I love for both a fall/winter dinner entree or in smaller form (1 cube chicken + veg on a small skewer or toothpick), as an hors d’oeuvre. Sumac is found in the spice section of the market and has a lovely tart flavor. It pairs beautifully with pomegranate which is in season right now. I love pomegranate molasses – a thick, reduced syrup made from pomegranate juice. I ended up eating these skewers over cauliflower rice and drizzling the pomegranate sauce heavily over everything! Since Moink also sells beef and lamb, I think you could swap either meat for chicken here. In fact, I think lamb would work the best! Pre-heat the oven to 375 degrees. Prepare a sheet pan with unbleached parchment paper and 8-9 skewers. In a small bowl, mix the sea salt and sumac and set aside. Pat the chicken dry and cut the chicken into about ½ inch cubes. Drizzle with a couple teaspoons of olive oil and toss to coat lightly. Rub the sumac and sea salt mixture over each chicken cube. Pierce the chicken cube with a skewer and then add a square of onion and then a square of fennel. Do this about 3 times per skewer. When the skewers are prepared, set them on the prepared sheet pan and cook for 12-13 minutes or until almost fully cooked through. Meanwhile, mix the pomegranate molasses, maple syrup, and black pepper in a saucepan and heat over medium heat until slightly thickened – enough to coat the back of a spoon. We can’t wait to see what sorts of recipes you make with your Moink Box! Be sure to tag us @moinkbox or #GetMoinked so we can see your yummy creations. Enjoy!